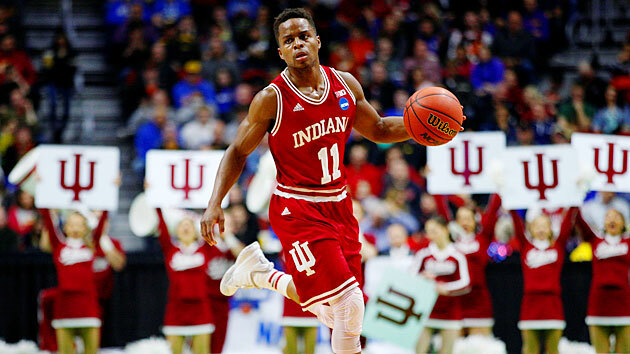 Everything you need to know about the Indiana Hoosiers as they head into the Sweet 16. As part of its preview of the Sweet 16, SI.com is taking a look at all remaining teams in the field. Adjusted offense and defense statistics—which measure the number of points scored and allowed per 100 possessions—are from kenpom.com and the rankings are relative to the remaining teams in the field. All other advanced stats are also from kenpom.com (unless noted otherwise) and are through March 21​. The Case For: Ferrell, who continues to stake his claim as one of the best players in Hoosiers history, has been superb in the first two games. That's no surprise. But it’s been the ascension of freshman center Thomas Bryant that has turned Indiana into a legitimate national title contender. The highly touted 6'10" big man has been good this year, averaging 11.9 points and 5.7 rebounds per game. But he was utterly dominant down the stretch against Kentucky in the round of 32, scoring 15 of his 19 points in the final eight minutes, grabbing five rebounds and shooting 78% from the line. Bryant's offensive rating is 32nd nationally among players who use at least 20-24% of their team's possessions, according to kenpom.com. His emergence gives the Hoosiers the same dynamic inside-out combination that Sweet 16 foe North Carolina has in 6’1” senior guard Marcus Paige and 6’10” player of the year candidate Brice Johnson. Add in 6’7” junior Troy Williams (13.0 ppg) and 6’4” senior Nick Zeisloft (42.5 percent from three) and it's easy to see why Indiana has improved so much after starting the season 5-3 and losing by 20 points at Duke in early December. The Case Against: There’s a fairly big gap between the Hoosiers' offensive performance (stellar) and their defensive performance (merely above-average). Indiana gives up 49.4% percent effective field goal percentage, per KenPom. It has the 116th ranked three-point defense. It let Kentucky’s Tyler Ulis (27 points) and Jamal Murray (16) score at will. Trying to guard the Tar Heels' relentless offensive attack and keep its bigs off the glass will be a challenge for Indiana, which ranks 124th in offensive rebound percentage against and 103rd in total rebounds. And while Bryant impressed everybody with his late-game dominance over Kentucky, he’s also been wildly inconsistent in his freshman season. There’s the Bryant who scored 23 points in 27 minutes against Minnesota in January. But there’s also the Bryant who scored just eight against Maryland in the regular season finale on March 6. We know the talent is there for the former five-star, McDonald’s All-American. And we’ve seen how he can change games. But can he do it against the Johnson, as well as 6’9” Kennedy Meeks and 6’8” Isaiah Hicks? That could be a different story, and one that may well determine the outcome.